Back in 1994, right after getting my PhD, I got a short-lived job working on COBE, which at the time was winding down after a long and highly successful mission. But because the project was closing down, it was a difficult work environment (which is true for any project): the computing equipment was aging, the money was tight, and the only problems left to solve were ones that were extremely difficult – and in my case, intractable. The writing on the wall was clear enough. After a few months, STIS was complete enough that it was time to start testing it. STIS was being built at – you guessed it – Ball in Boulder, and we all took turns flying out to Colorado to work on the new camera. 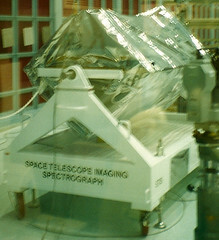 It was in a clean room in a warehouse together with NICMOS, another camera slated to be taken up to Hubble. We sat in a little cubicled-off area with computers and a storage locker full of snacks, and got down to the business of examining the data from the camera. 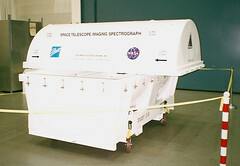 Then, in 2000, when STIS funding was winding down, I had to choose between staying with the company (and working on the Cosmic Origins Spectrograph, which was installed on Hubble just yesterday), or pursuing a new career in education and public outreach. I found I was enjoying talking about and even evangelizing science more than doing the research, so I took this new path, and off I went to California with my family. And after 6 years there, I was offered the chance to write a second book, and so I took it. When my wife mentioned that we could live anywhere in the country if I became a full-time writer – and then specifically suggested Boulder – that made the decision easier.